We recently designed a new suite of marketing materials for our client Global Aerospace, Inc., of Parsippany, NJ, a worldwide provider of aerospace insurance products and services. The materials include a pocket folder / brochure that showcases the company’s global experience in underwriting insurance for leading insurers and reinsurers. 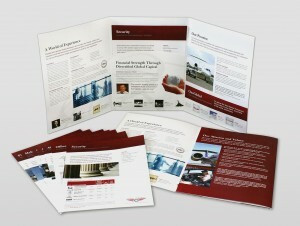 Single-sheet flyers provide more detailed information on the scope of Global Aerospace’s products and services for aircraft, ground operations, airports and helicopters.